Orchestral Scoring in Studio One 2, Part 5. Video! I’d like to talk a little bit about writing music for video in Studio One. 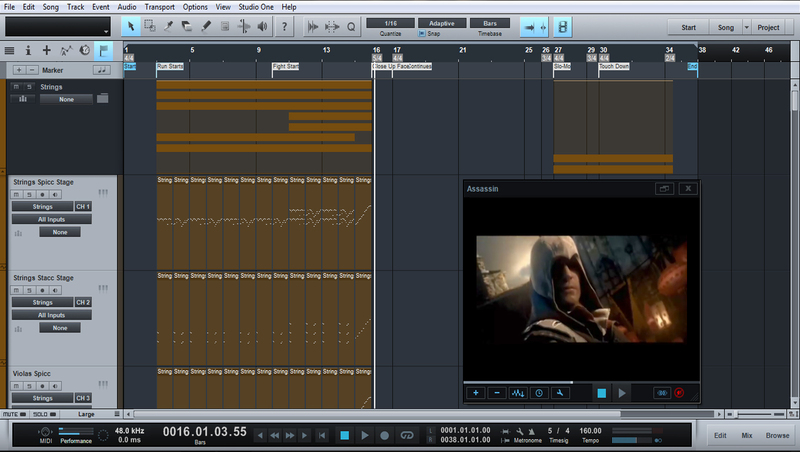 I had to do a multimedia project at my university as an exam, so I made a short trailer-type video by using trailer from Ubisoft’s “Assassin’s Creed” video game, and I decided to score my own music for it using my orchestral template. The process is pretty simple actually. All you need to do is import a video file in Studio One Video Player and it will automatically play whenever you click Play on the transport controls. (Studio One doesn’t have video tracks, by the way.) If you want to add marker positions for your video, you have to scroll through the video and place markers on the marker track when the appropriate scene shows in your video. I like to keep my transport bar count set to bars instead of frames, because when I am writing music for video I need to sync my music to it and still follow the proper musical­ beat. I always take a look at the video cue a couple of times and think about what kind of music I am going to write for it. Then I start placing markers and name them to describe the scene that the video player is about to show. Placing markers is pretty much the same as in other DAWs. Find the place where you need to put marker, and click the “+” button on the left of the marker track, and you will see the marker tagged with a number on the marker track.You can rename the marker by double-clicking on it and typing in a name in the pop-up window. Once you’ve done that, you are ready for some serious professional scoring. I had a lot of fun with this project, and I am definitely seeing myself using PreSonus Studio One as my main DAW of choice from now on. Need I say that I’ve un-installed my other DAW I was using all these years? The guys from PreSonus are doing a great job with this and with some patches and new versions, StudioOne has a bright future in becoming the industry’s top DAW out there. And feel free to visit my Youtube Channel. You can also listen to some of my tracks at Reverbnation and visit me on IMDb. I found this article by accident and I’m so grateful to you for writing it. I’ve been interested in scoring orchestra for music and film for a while and this has helped my greatly. Thank you! Hi! Thanks for this great article about orchestral use in Studio One. One question comes to mind right now. Are you still panning the orchestral instruments as described even when they are already recorded in their seating positions? And if so, does this weaken the signal of the panned instrument? I noticed this in some libraries. When I first saw this title Orchestral Scoring in Studio One 2, Part 5. Video! | PreSonus Blog on google I just whent and bookmark it. Youre so cool! I dont suppose Ive read anything like this before. So good to search out any individual with some unique thoughts on this subject. realy thank you for beginning this up. this web site is something that’s needed on the net, someone with a little originality. helpful job for bringing one thing new to the internet! When I first saw this title Orchestral Scoring in Studio One 2, Part 5. Video! | PreSonus Blog on google I just whent and bookmark it. Hi there, I found your web site via Google while looking for a related topic, your site came up, it looks great. I have bookmarked it in my google bookmarks. For us Windows users, what do we use for a video track , working with Studio One? When I first saw this title Orchestral Scoring in Studio One 2, Part 5. Video! | PreSonus Blog on google I just whent and bookmark it. Some truly fantastic articles on this website, appreciate it for contribution. “When he has ceased to hear the many, he may discern the One the inner sound which kills the outer.” by H Hahn Blavatsky. You are right. Video is not available for Windows x64. But thats not the lack of Studio One. It uses Apple QuickTime which is only available for WIN x32. I am glad to own an Apple System there is no problem with 64bit and video. When I first saw this title Orchestral Scoring in Studio One 2, Part 5. Video! | PreSonus Blog on google I just whent and bookmark it. I was sharingthis with my father on Sunday. Do you have any other facts ? When I first saw this title Orchestral Scoring in Studio One 2, Part 5. Video! | PreSonus Blog on google I just whent and bookmark it. Manner cool! Some very legitimate factors! I admire you writing this text and the remainder of the website is extraordinarily good. Thanks but I’ve noticed that video playback is still not available for x64 versions? or I am missing something?